When it comes to deadbolts, it is good to know how important the purpose these products serve really is. We are speaking of deadbolt locks designed to be installed in a door that allow the door to be securely locked keeping the door from being bypassed usually by any unwanted intruders. Deadbolts are usually installed in a separate pre drilled hole just above a less secure spring locking door handle or door knob on the door. The deadbolt lock is a much more secure alternative than the standard locking doorknob or locking door handle. It is a much more difficult task to defeat a properly installed deadbolt due to its locking mechanism and deep penetration into the door frame. The strike plate is a heavy duty steel plate that is included with most deadbolts and is installed in alignment on the door frame where the deadbolt will penetrate into the frame when in the locked position. This heavy duty strike plate typically has long screws that are driven deep into the mainframe of the living structure to secure it from being easily compromised. There are many different varieties and styles of deadbolts available on today’s market. Not to mention different grades of quality, durability and strength designed and manufactured by the industry leaders. The most common of this type of lock is the standard deadbolt lock like the one used for entry doors on a typical home or business. These deadbolts can be purchased in many different designs and styles. Today there are single cylinder, double cylinder, electronic or keyless deadbolt locks available. The single cylinder style only accepts a key on the outside of the door to operate the lock. The inside of the door has a non removable thumb turn. This allows it to be operated from the inside of the door without a key by turning the thumb turn. The double cylinder type of deadbolt accepts a key from either side of the door to operate the lock. Some of these double cylinder deadbolts on the market today have an added misuse and fire safety feature built in. This added safety function allows the deadbolt to be locked from the outside only if there is a key in the inside cylinder. This is to prevent anyone from using a deadbolt to lock someone inside any location and likewise keep anyone from accidentally being locked inside in case there is a fire or any other emergency. You can also lock the deadbolt and remove the key from the inside of the door. 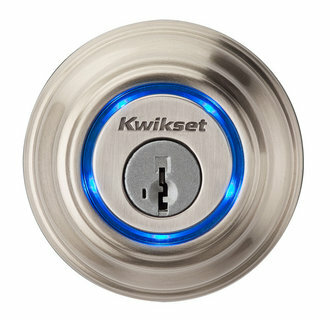 The electronic or keyless deadbolts have the convenient feature of never having to search for and insert a key. This is rather convenient when in a hurry to gain entry to your home or business. Most keyless electronic deadbolts work upon the entry of a set code pressed on the numbered keypad portion of the lock. Some models include a remote control that can activate the lock into the locked or unlocked position with the press of a button when within close proximity of the lock. There are also electronic deadbolts that use a preset code on a small card that is the same size as a credit card. When you swipe the card through the slot provided on the lock, it unlocks the door. You may have seen this type of lock in hotels and other areas such as large places of employment with certain security restricted work areas. Some of the industry leaders in deadbolts on today’s market are Baldwin, Best Locks, Copper Creek, Kwikset, Medeco, Omnia, Sargent, Schlage, Weiser, Weslock and Yale, with Medeco and Sargent having a reputation of having the best quality deadbolts. These manufacturers have been in the lock making business a long time. They have a reputation for making heavy duty and reliable deadbolts meeting today’s industry standards. Most deadbolts can be installed rather easily by the do it yourselfer. These locks can be purchased at home improvement stores, hardware stores and even department stores. For the best selection visit Factory Direct Hardware to find the widest and best selection of deadbolts.